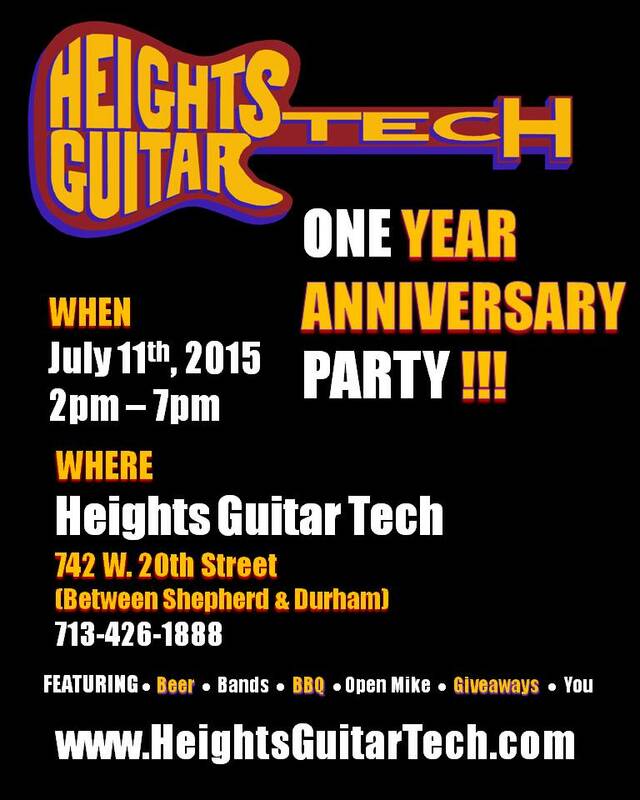 Heights Guitar Tech to Celebrate its ONE-YEAR ANNIVERSARY with a Birthday Bash & YOU are Invited! HOUSTON, TX (July 2015) – Houston’s newest musical instrument and repair shop, Heights Guitar Tech is excited to announce our ONE YEAR ANNIVERSARY PARTY at 742 W. 20th Street (between Shepherd & Durham) on Saturday, July 11th at 2pm. Dedicated to serving the needs of local musicians; Heights Guitar Tech was founded with some pretty simple concepts in mind. Namely, to provide quality repair of every type of guitar or stringed instrument in a quality and professional manner with a quick and timely turn-around rate. Burman and Boriack enlisted Ed Loco and Bob Hensley – longtime musicians & veterans of the industry to ensure the success of HGT. Ed Loco has been in the Houston area all his life, and involved in the Houston Music scene since 1978. He has performed locally and internationally with bands such as U.Y.U.S., Humumgus, Vatos Locos, Verbal Abuse, and as a hired gun for Gang Green and DRI. Ed began his repair career at Rockin’ Robin as a guitar tech under the supervision of Mike Simon and Jim Fulton in 1998 and has been satisfying customers ever since. Although Ed works on many different kinds of instruments, his specialty Is the Floyd Rose challenge – unlike many techs, he loves this system – and if he can’t make it work, it can’t be done! Bob Hensley is an expert luthier with over 30 years experience who specializes in setups and repairs of acoustical and electrical stringed instruments. Hensley is available to repair your guitars, bass, banjos, mandolins, ukes, fiddles, cellos, violins, dulcimers and more. We are still Rocking!!! Our first year anniversary party on July 11th will feature live music performances by local and internationally known musicians, with an open mike for guests to join in or play a song or two, along with barbecue, beer, and giveaways featured every half hour 2pm – 7pm on Saturday, July 11th. Heights Guitar Tech (https://heightsguitartech.com/) is a stringed instrument repair shop that also offers tube amp repairs, vintage guitars & music accessories sales, music lessons, and a friendly atmosphere for musicians, conveniently located at 742 W. 20th Street (between Shepherd & Durham) in the Houston Heights. Sponsored by Zebra Properties of Re/Max Metro. Zebra properties is owned and operated by local personality Amy Lynch Kolflat, (www.amyzebra.com) artist of the famed Zebra Mobile Art Car. Zebra properties is your real estate team for the greater Houston area specializing in the Heights and inner loop.